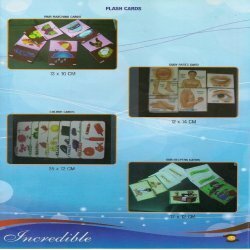 We are a leading Manufacturer of flash cards, map & puzzles, eye hand coordination, flash card, link block and braille letter from Indore, India. An extensive range of Stepper Gym Equipment can also be availed from us, which are made by utilizing the best grade raw materials and modern technology tools at vendors’ end. The Map & Puzzles are provided by us consists of board cutouts of the various states of the countries, assembled on a wooden frame. All the states in countries are depicted on the map and the user can brainstorm and solve it, thus helping to generate their interest in geography. 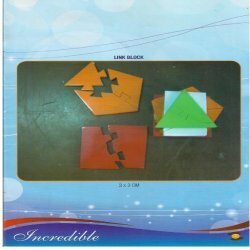 We produce them using quality materials which are long lasting and the puzzles are made using natural materials which makes them perfectly safe for children to use. 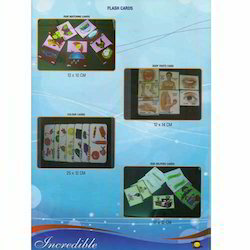 We are also engaged in offering a comprehensive range of Eye Hand Coordination that is offered ratified vendors, these eye hand coordinator help the users in recognizing colours, alphabets, numerals, multiplication tables etc. at leading prices in industry. We offer a quality range of equipments are fabricated in compliance with latest technical developments in the industry. These are available at very reasonable rates. These fascinating ranges of products are great for developing the early learning skills of kids through different amusing games. Human body Parts: - Human body parts picture duly affixed on 4 mm MDF board of size 12 x 14cm. Each major parts (11 to 12 numbers) shall be affixed on separate board with their name in English & Hindi both. Colour cards: - (10 nos.) The specific colours of pictures i.e. violet, blue, green, yellow, orange, red, brown, pink, black & white shall be provided with the name of colour. Each card board showing different colours & having printed pictures of same colour & name of the colour made out of from 4 mm MDF board of size 25cm x 12cm. IQ Puzzule: -IQ puzzule of elephant shall be made by cutting the picture affixed on 4 mm MDF board in 6 to 8 pieces of different colours. The cutout board shall be affixed on 2.5 mm MDF board of size 30cm x 24cm. Each cut out shall be affixed with lifting knob (without nails) for easy lifting. 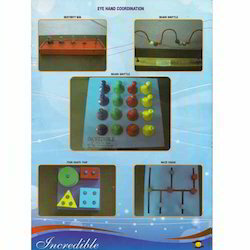 We are a renowned manufacturer and supplier of Braille Letter. 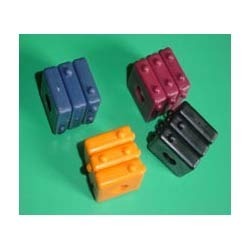 These cubes are comprised of three square disks mounted on a common vertical spindle. There are raised dots on three edges of each disk (the fourth edge has no dots). Manufactured by using finest quality materials and innovative techniques are forming easy to learn letter formation. These products are light in weight and easy to handle. Looking for Learning Material for Mentally Retarded Childrens ?